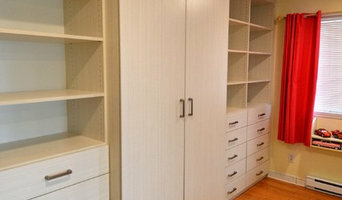 Customized, efficient closet storage systems to simplify your home! Simplespace is dedicated to bringing new levels of efficiency, space utilization, comfort, style and ergonomic advantages to your bedroom closet and home storage. 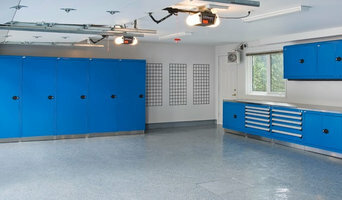 Since 2006, Espace Garage Plus (EGP) specializes in custom residential garage design and remodelling. Each garage is unique, which is why we design and develop custom solutions with exclusive product lines. Measurements and photos, recording and 3D conceptualization of your garage make for thorough analysis of your needs and desires and allow you thereafter to easily view the ideas our professionals will propose. In addition, all our plans come with a quotation detailing precisely the costs associated with your project. Contact us for a FREE QUOTATION at 1 (888) 934-6403. I am a full time designer at STIL Design, a Montreal based storage solution company. At STIL Design we specialize in closet interiors, wall beds, media units and storage units of all different sizes and styles. Using my expertise in the field, our state of the art facility and professional installation team, together we can design the walk in closet of your dreams. 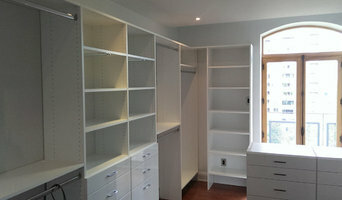 All closets are designed by myself and installed by our team. At Closets by Design we believe that your home is your sanctuary. We pride ourselves on providing the best value in the industry along with exceptional quality and service. Our highly trained designers will meet with you free of charge to create the space you've always dreamed of. Once your system is designed, our skilled production team goes to work in our state of the art factory. Each system is custom built to your specifications and our installation team installs the units quickly and efficiently. Don't wait, call Closets by Design and schedule your free consultation today Chez Closets by Design, nous voyons votre maison comme votre sanctuaire. Nous nous faisons une fierté de vous offrir ce qui se fait de mieux dans l’industrie, qualité et service exceptionnels en prime. Nos designers hautement qualifiés vous rencontreront gratuitement pour créer l’espace dont vous avez toujours rêvé. La conception de votre système terminée, notre équipe de production expérimentée se met au travail dans notre usine à la fine pointe de la technologie. Chaque système est construit sur mesure, selon vos spécifications, et notre équipe d’installation installe les unités aussi rapidement qu’efficacement. N’attendez pas! Téléphonez chez Closets by Design dès maintenant afin de prendre un rendez-vous pour profiter de votre consultation gratuite. 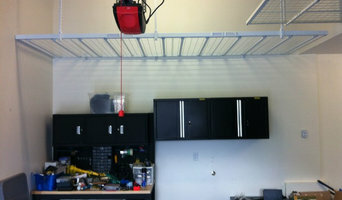 We are a custom home organizers specialist with all focus on the garage. We will transform your garage into a usefull space for storage and with a keen eye to detail which is a refelction of the castel you've built for yourself. GLENN ROBERTSON DESIGN is the definitive, built-in custom cabinet and closet design, manufacturing and installation company. Expertly crafted at our local facility, our made to measure installations are meticulously fitted to your home's specific requirements. Closets, wardrobes, vanities, entertainment units, home offices, pantries, even garages; every area of your home is Glenn's domain. Let us realize your vision. I will help you reorganize and declutter your home to make the space work at 100% for you and your required needs as well as set you up with everything you need to keep the space running smoothly after out time together is over. AlumComplete specializes in custom closets, aluminum sliding and suspended doors, inter-room partitions, and walk-in closets. Our team is dedicated to improve your home storage and to bringing your design ideas to life for very affordable prices! Home organization products are at the top of today’s consumer’s wish list. Until recently, consumers had to choose from two distinct product lines – a high end, very expensive custom design or a basic, very inexpensive racking alternative. Proslat’s mission was to provide a simple, environmentally friendly, versatile storage solution that filled the need for a product that fit neatly between these two extremes. Proslat was founded by Eric Letham in 2009 and is headquartered in Quebec . The Proslat team brings a combined 30 years of award-winning product development experience to the business and an unshakeable belief in the product. We have enjoyed steady growth since launching our patented, innovative wall panel to the market in late 2010 and we continue to build consumer loyalty by offering consistency, reliability and quality products. We hold patents in Canada and the US on the design of the wall panel, this basis of the Proslat storage solution. We are guided by the belief that the key to our success is product superiority. We promise our patented panels “out perform”, “out price”, and “out look” any of our competitors. What makes a ProSlat’s storage solution stand out from the crowd? We are green. Our wall panels are manufactured using 90% recycle material making them one of the greenest storage solutions in the market today. We are easy to install. Any weekend warrior can install a Proslat wall with a stud finder, a level, a saw, screws and a drill. We are flexible. A Proslat storage solution is based on individual panels so you can install them (on drywall or directly mounted on the studs) in any configuration that suits you — as a track, a section or an entire wall. We are water resistant. Our panels are not affected by mold, mildew, or water. Proslat may be installed in damp areas where drywall and wood might absorb the humidity. We are robust. Impact testing indicates that a Proslat wall panel is up to 25 times more impact resistant than drywall and can hold up to 75 lbs per linear foot. We are made to last. Made in North American, we stand behind our product with a 10 year limited warranty. Everything we sell is guaranteed so the product has to do what we promise. We are attractive. Hidden screw design gives a professional finish. We are cost effective. Our price per square foot is simply unbeatable. At Proslat we believe it’s the simple things in life that make the difference. Sort It Out With Samara is a professional business that provides all types of organizational solutions, tips and tools. STIL Design is a Montreal based custom storage solution company. Our expertise include but are not limited to all sorts of custom closets, built ins, laundry room storage, garage storage, entertainment centers, sliding doors, murphy wall beds, office units and more! Our toughest challenges have inspired our team every day for the last 20 years. We continue to provide the Greater Montreal area with personalized closet organizers and storage solutions, because this isn’t just our job, it’s our passion! Stil Design is a family run business and we understand that your home is a reflection of who you are so when you choose to work with us, you choose to work with our family. With STIL Design, you don’t just get a designer who wants to get the job done. You get a family who will be with you from start to finish. From quotation to installation you will have the full support of our team. We have our own in house, state of the art CNC machinery allowing us to customize your space to your exact specifications. At Stil Design there are no “standard sizes”. We will work within your budget and square footage and collaborate with you to make your custom storage solution dreams come true. Born out of a belief that custom storage could be both functional and yet elegant, TCM Custom Designs provides custom solutions that solve a wide range of space challenges in the home. With free on-site evaluations, we combine your needs and vision with our expertise to create solutions that work. Our 3D computer images let you visualize the space as it will be rather than letting you decipher simple line drawings. Our color selection and quality are a step up from other local offerings, giving you real value for your investment. We’ll come to your home or you can make an appointment to make color and accessory selections in our showroom. We create custom cabinetry from closets to kitchens. We love working with clients to come up with solutions that fit everything from the "I just need to make it work" budget to the "Wow that is amazing". As an extremely organized person who loves optimizing space by organizing belongings and furniture, I teach my clients how to maintain their organized environments. I have experience and training working with seniors whose goal it is to downsize or "rightsize", as well as with clients with chronic disorganization issues which makes staying organized significantly more difficult. My passion, however, is conceptualizing and organizing children's playrooms in ways that make it simple for children to clean up after themselves. Before hiring a professional organizer, consider exactly what you need. Have you just moved into a Sainte Marie, IL home and have no idea where to put everything? You may want to consider an organizer who specializes in room-by-room space planning or estate organization. Perhaps you’re faced with a tiny closet and an overflowing wardrobe. In that case find a professional who focuses on closets to help you get back on track. Also consider the types of objects that need organization. Are they items like books, family photos, files or collections? You’ll want a professional organizer who has experience designing custom systems with Sainte Marie, IL companies that will best fit your needs. Find a professional closet and home organizer on Houzz. Narrow your search in the Professionals section on Houzz to Sainte Marie, IL closets and home organization.